RemoteAIM uses the AIM "external program control" feature to provide a remote control link between the AIM software and the Zplots Excel application. 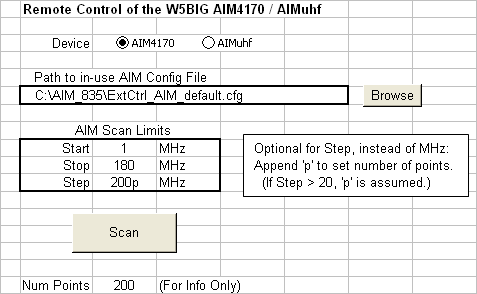 Details of this AIM feature may be found in the AIM manual (pdf) under Appendix 10 - External Control. You enter the desired scan limits on the RemoteAIM workbook (equivalent to the AIM "Limits" window) and click the "Scan" button. RemoteAIM will trigger the AIM program to perform a scan and save the results. Then Zplots will be automatically opened (if it is not open already) and the scan data will be loaded. Note that the "Step" field serves double duty. If you enter a numeric value such as "1" or "0.5" that value will be interpreted as a step size in MHz. Alternatively, if you append the letter "p" after the value it will be interpreted to mean scan from Start to Stop using that number of points in the scan. Important: If you wish to enter fractional MHz values for Start, Stop, or Step and you normally use a comma as the decimal point when working with Excel, then you should continue to use commas with RemoteAIM. Values you enter will be converted to the correct format for use by the AIM program. Before using RemoteAIM you must make a one-time change to the AIM Config File. To do so, start the AIM program and then click Help > Edit Config File. Change parameter "external program control" from the default value of "1" to either "2" or "3". From the Config File editor window use File > Save as to save the change, either with the same file name or with a new name. The example above shows the change to be made. After you close the editor window be sure to restart the AIM program. Then leave AIM running in its own window, return to the RemoteAIM Excel window, and use the "Browse" button to set the path to the AIM Config File that is now being used. Setting "external program control" to a value of "3" will result in a clock display in the upper-left corner of the AIM window. This serves as a convenient visual reminder that AIM is running in "able to accept external control trigger" mode. Scroll to the bottom of this page or click here for the download link for the RemoteAIM.xls workbook. RemoteVNWA uses the VNWA "remote control" feature to provide a remote control link between the VNWA software and the Zplots Excel application. Details of this VNWA feature may be found under Help > Contents > Special Topics > Remote-controlling the VNWA (via script file). If the VNWA program is running already, close that window. Then with the RemoteVNWA workbook: set the path to the VNWA.exe file (using the "Browse" button), set the desired sweep parameters, and click the "Sweep" button. RemoteVNWA will start the VNWA program in "remote control" mode, set the necessary parameter values, perform a sweep, save the results, and close the VNWA window. Then Zplots will be automatically opened (if it is not open already) and the sweep data will be loaded. Important: If you wish to enter fractional MHz values for Start, Stop, or Step and you normally use a comma as the decimal point when working with Excel, then you should continue to use commas with RemoteVNWA. Values you enter will be converted to the correct format for use by the VNWA program. The entries you make on RemoteVNWA are the equivalent of entries in several different VNWA windows. For example, the RemoteVNWA Start and Stop fields are the same as double-clicking on the Start, Center, Span, or Stop text of the main VNWA screen and then making entries in the "Input" window. 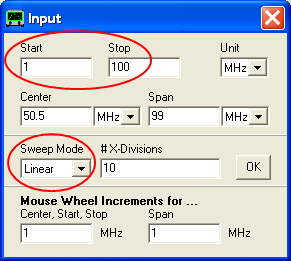 The VNWA "Sweep Mode" will be set to Linear if you enter a RemoteVNWA Step MHz value or if you append "p" to the Step value. If you append "e" to the Step value then the VNWA "Sweep Mode" will be set to Log. Similarly, other RemoteVNWA entries are equivalent to the entries on the "VNWA Sweep Settings" window, normally accessed via Settings > Sweep. Note that if you specify a RemoteVNWA Step size in MHz then the VNWA "Number of Datapoints" value will be calculated and set accordingly. For example, if you entered Start and Stop values of 1 and 100 MHz and a Step value of 0.25 MHz, the VNWA "Number of Datapoints" value will be set to 397 which will result in a measurement every 0.25 MHz. This saves you from having to use your pocket calculator if you want measurement points at particular frequency values. Before using RemoteVNWA you may wish to make sure that the VNWA program will open with a valid calibration file already loaded. 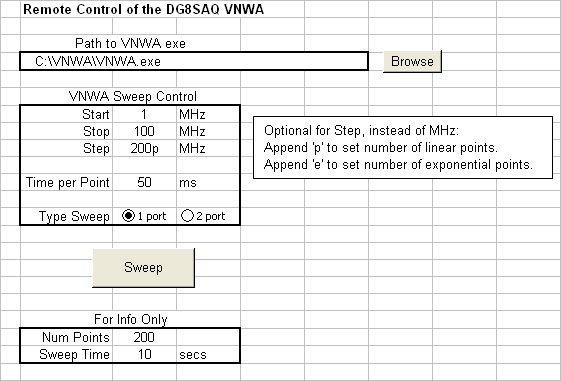 One convenient way to do that is to enter the desired sweep control values on the RemoteVNWA workbook and click the "Sweep" button. After a short delay the VNWA window will open and the sweep will start. When it does, immediately click the "sweeping" button (lower right corner, normally "Single Sweep"). That will stop the sweep but leave the VNWA window open. The Start, Stop, Sweep Mode, Number of Datapoints, and Time per data point values will have been set as you directed. 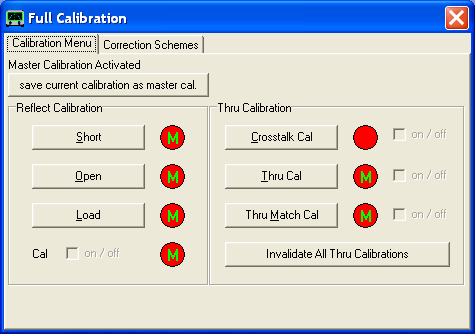 You can then use Measure > Calibrate to open the VNWA "Full Calibration" window, do a calibration, and (optionally) save a new calibration file (via File > Save > Calibration). Then close the VNWA window. Whether you saved a new calibration file or not, the next time VNWA opens it will open with the most recent calibration data. 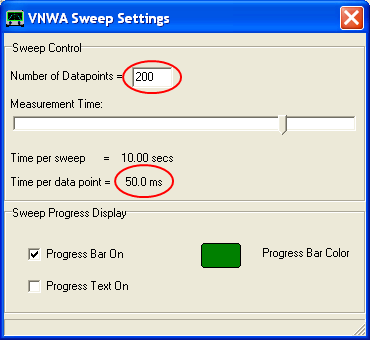 If you followed the procedure above to create new calibration data, when you return to RemoteVNWA you will find that the "Sweep" button has changed to "Waiting (Press to Reset)". That's because RemoteVNWA is still waiting for the previous sweep to complete, the one that you intentionally stopped. Just click the button to return to the normal state. 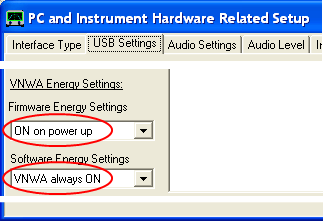 One final VNWA change you may wish to make is found under Options > Setup > USB Settings. You may wish to change the "Energy Settings" to the choices as shown at left. That way the VNWA hardware will not be powered off each time the VNWA program window is closed. Instead, the hardware will stay powered on as long as the PC is on and the USB cable is plugged in. Hence the instrument will always be "warmed up" for more accurate measurements. Download RemoteAIM.xls and/or RemoteVNWA.xls. Free. Both require Excel 97 or later. Note that both workbooks are also included in version 2.2 or later of the Zplots.zip download package so you may have them already. Important: You must allow Excel macros to be enabled. Please see Understanding Excel Macro Virus Warnings for more details. Neither workbook will operate correctly with other spreadsheet software such as Open Office Calc, Quattro Pro, Microsoft Works, or versions of Excel earlier than Excel 97. None of these other spreadsheet programs fully support Excel macros.